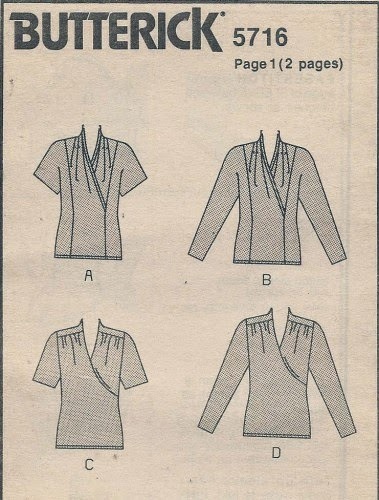 I found this blouse pattern at a church sale a few months ago, when I scored a whole bag of 15 vintage-y patterns -- in my size -- for $1.00. 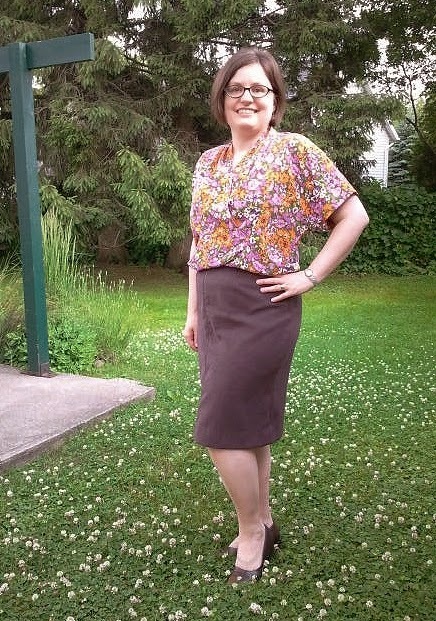 There are about 6 dresses in there that are on my to-make-someday list, although I hadn't planned on making this blouse so quickly after finding this pattern. 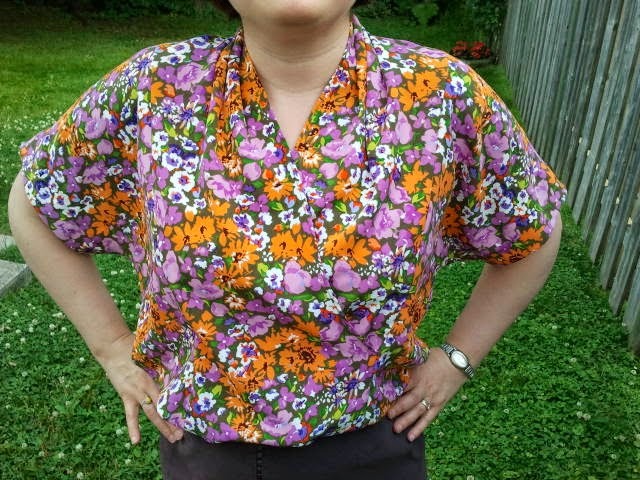 But I was tidying up the stash and came across a length of floral polyester that I like to call my "Ukrainian grandmother" print, which I bought just because I liked it, ages ago. There was just enough for a blouse, and I immediately thought of this one -- the combination of print and style seemed right. Fortunately for me, this really is "fast & easy". The part of construction that took me the longest was deciding how to finish the sleeve facings. I made View A in size 14 (my envelope is size 12-14-16). I was worried that the crossover might need a snap after I was done, but if anything, it is a far higher neckline than I expected. There's room in the pattern for shoulder pads (not surprising in a pattern with copyright 1990), but I didn't make too much of an adjustment because I thought that the depth of the sleeve would be fine as it was, without shoulder pads of course. 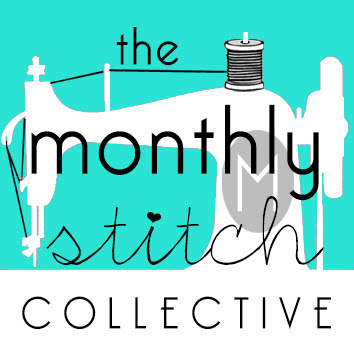 I cut it and created the very interesting pleated neckline, then stitched the side pieces on, and attached the whole front complete with finished neckline/collar to the also-pieced back. Hemmed it, and then simply hemmed and hawed over the sleeve finish. I left it for a day or two to consider some options. The problem was that the sleeve facing is quite deep, and I didn't want a line of topstitching 2 inches into the sleeve. But I also didn't want the facings to flop around. I didn't want to trim them because with the loose fit of the sleeve I wanted the glimpse of sleeve interior to match the exterior. So I finally decided to fuse them down with some Steam-A-Seam. I tested it first and it didn't affect the feel of the fabric so I finished them off, finally, last night. And then wore it today! It is great. It fits so nicely and nothing gapes or pulls. It is very comfortable and yet has some nice design features. I'd love to make it again in a different kind of fabric -- not a polyester that is inclined to static, although I do love the look of this one. I can imagine it with colour/print blocking or in a heavier fabric for fall. 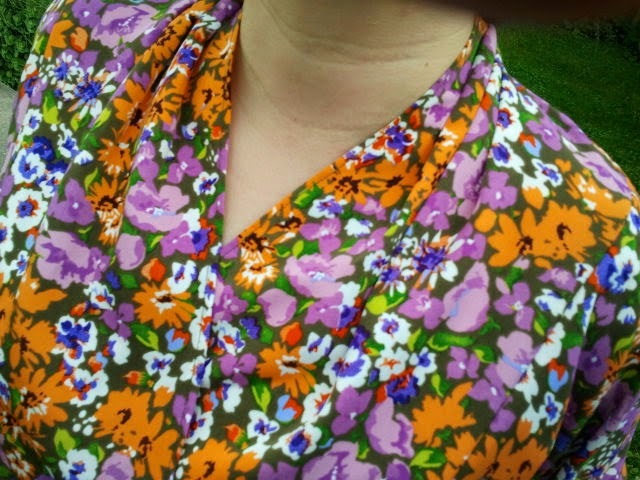 Here's what I looked like in today's new blouse. See how the pleats come around the neck from centre back. how this one is soft and drapy as it is. I enjoyed making this and enjoyed wearing it too. 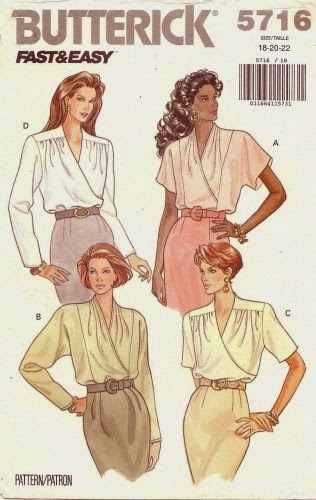 I'll have to try more from that grab-bag of old patterns! Very pretty I like that the neckline is not too low. I just watched the movie, "When Harry Met Sally." 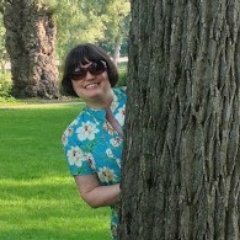 In the final scene, Sally is wearing a lovely knit top very similar to yours and I was thinking about how pretty it was and that I should make one! The soft drapes and surplice neckline look so lovely. I'll have to rewatch that just for the clothes! This pattern is from 1990, the movie came out in 1989...wonder if the designer was inspired by it?? I love neckline like these, I. Think they are so feminine and flattering. Nice top! Thank you! I agree that this is a pretty universally flattering shape. Easy to modernize too.